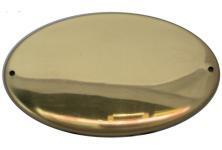 Our brass plates 1,5 mm thick with round edge are elegant and essential, with classic and resistant finishing. Thanks to the screen printed inscription and the transparent facing painting, the label is well readable and guarantees long time duration. Several shapes on customer’s drawing available.